What Causes Evergreen Shrubs to Die? Many evergreen shrubs bloom in the spring or summer, and most retain their foliage year-round. Evergreen shrubs are often used as borders, privacy screens or focal points in a home garden. While these plants are usually quite hardy, some things can cause evergreen shrubs to weaken and even die if not properly maintained. Environmental conditions can kill evergreen shrubs, according to Sharon D. Anderson, director of the North Dakota State University School of Agriculture and Applied Science. These include root disturbances, such as when the ground is disturbed in order to lay pipes, cement or other construction. Overly soggy soil can cause fungal growth, which can attack and kill the roots of shrubs, trees and other plants. Chemicals in the soil such as those carried by water runoff or by chemically treated water can kill plants, as can alkaline spots. Affected shrubs will show a slow decline over the course of many months or even a few years. Evergreen shrubs will often die if their roots are killed, which can happen when winter temperatures alternate between freezing and thawing. This is called "frost upheaval," and can seriously damage roots or kill them completely. In such cases, the shrub will eventually die. Affected shrubs will usually wilt and turn brown all at once. 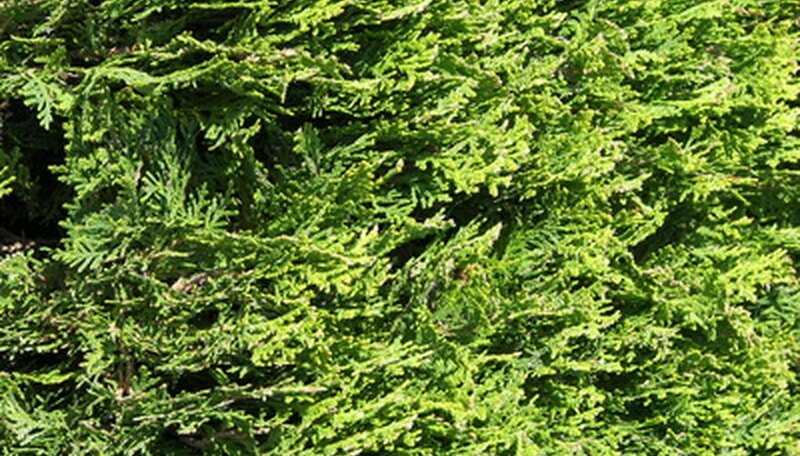 Anderson suggests preventing this problem by placing a thick layer of mulch around your evergreen shrub. The mulch conserves the moisture in the roots, and protects against freezing winter temperatures. Many homeowners do not know that the sun can scorch the foliage of evergreen shrubs. In cases of extreme drought, the combination of no water, hot sun and strong winds can cause an evergreen shrub to die. Most shrubs begin to die from the outer edges inward, turning brown as they decline. So a planting site that receives morning sun followed by afternoon shade is beneficial for climates with very hot summers. While many water-borne fungi simply cause the leaves to develop unattractive spots, other fungi that ride on the bodies of insects or live in the soil can attack the heart wood of evergreen shrubs or the roots. In the latter two cases, the plant will often develop cankers, areas of dead wood that house spore growth, that can girdle the plant, causing it to strangle from lack of nutrients and water. If the fungus attacks the roots, the plant will show a quick overall decline, followed by death. A systematic fungicide treatment in the spring can prevent many fungal diseases. Anderson from North Dakota State also suggests pruning off any branches infected with cankers in order to prevent the spread of the fungi.